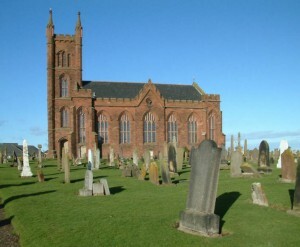 The present Dunbar Parish Church (Church of Scotland) was designed by Gillespie Graham in 1821. Unfortunately the church was badly damaged in 1987 by fire. It was restored by the architects Campbell and Arnott in 1990 and the bright and colourful modern interior now incorporates the Dunbar monument from the 17th century. The church also has some excellent stained glass windows by Douglas Hogg and Shona McInnes also dating from 1990. See more examples of the work of Shona McInnes by click here or on the previous links. Sunday Services are held at 11.00am.